The hero's next game is more about the man behind the mask than the web slinger. When Sony revealed that Insomniac games was working on a PlayStation 4 exclusive Spider-Man game set in an original universe, the specter of another game hung over the announcement -- 2004's Spider-Man 2. This movie tie-in is widely regarded as the game that perfected web swinging, as well as the title that no subsequent Spider-Man game ever lived up to. Creative director Bryan Intihar is aware of the stigma, but he doesn't seem worried. He's confident his game will make players feel like Spider-Man. His goal is more complicated. He wants players to feel like Peter Parker. 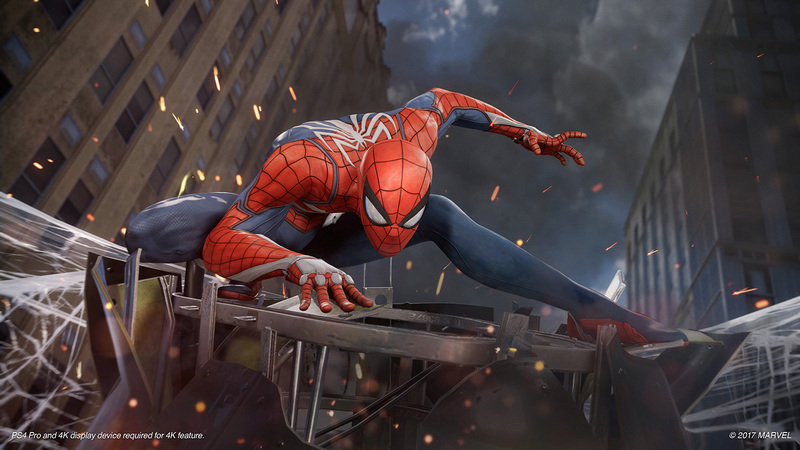 "I think you can't do a Spider-Man experience the right way if you don't tap into everything that Peter offers to the player or viewer," he told Engadget at E3. Intihar had just finished running a room of reporters through the game's trade-show demo -- a live but hands-off gameplay session piloted by a member of his team. The preview was all spectacle. Spider-Man leaping across a construction site on top of a skyscraper. Spider-Man stealthily taking out enemies as he investigates a crime scene. Spider-Man chasing a helicopter through downtown Manhattan. It looks fun, but the experience doesn't feel real until that helicopter starts to plummet toward a crowd below. The third-person camera zooms in and settles behind Spider-Man's mask, and his heroic confidence fades away as we hear Peter Parker plead with himself in a panicked voice. "Please don't screw this up." It's a small moment, but one informed by Intihar's years of spider fandom. Insomniac's Spider-Man won't retread the hero's origin story, but its version of Peter Parker is still driven by the guilt and self-doubt of his past. "There's a sense of reliability and vulnerability that he has in comparison to other heroes," Intihar explains. "He's not a god, like Thor. He's not rich and so polished as Tony Stark, and he's not driven like Steve Rogers." It's not that he isn't confident, it's just that he's extremely aware of the consequences of his failures. "I know that if I screw this up," Intihar says, speaking for Parker, "someone's going to die." That self-doubt has stuck with the character since his conception. Insomniac's story takes place several years after Peter Parker put on the cowl. He's been Spider-Man for years, and has just graduated college. He's starting his career as a young scientist and coming into his own as an adult. "I think what makes Marvel's world so interesting is, it's not a great character with superpowers, but it's the narrative." Intiher fondly describes classic Spider-Man comics as being kind of like a soap opera. "I think you want some of that in there, and we have that." Even so, he wouldn't touch on how that drama plays out. "Peter Parker is integral to the experience of this game," Intiher said, stopping just short of confirming whether one could play as Parker outside of his tights. When asked if the character's career as a photographer might contribute to an in-game photo mode, the creative director flatly said he couldn't talk about it. When asked if the trailer's cameo of Miles Morales, the Marvel Comics universe's other contemporary Spider-Man, was a hint that there may be more than one playable character, he kept it simple. "I will say that it's Peter's journey." Mum's the word for now, but Intiher's passion for Spider-Man lore and character-driven storytelling shows through -- and the tangents our conversation took toward obscure character traits, old comic book storytelling and pedantic debate over the highs and lows of Spider-Man 2's best-in-class web swinging left me feeling confident in Peter Parker's PS4 exclusive adventure. It's hard to tell without playing it myself, but if Intiher's confidence reflects the final version of the game, 2018 will be a great year for Spider fans.